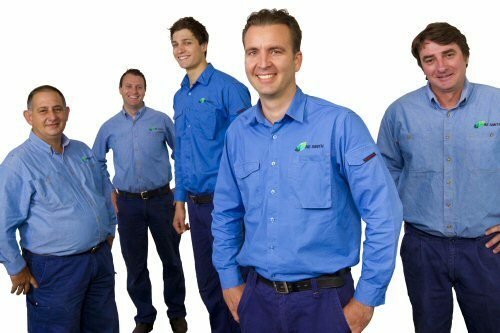 Recently appointed to provide preventative maintenance for Queensland Health means the Brisbane AE Smith Service team is managing the service requirements for Ipswich Hospital, Logan Hospital, North Lakes Hospital and various public health, aged care, dental and mental health facilities across Brisbane. “It was a very competitive tender process, but one where we were able to demonstrate how we combine our skills and expertise with a service approach that’s all about helping our clients,” says Matthew Steele, General Manager Brisbane, AE Smith Service (pictured third from left). “The primary focus was understanding how Queensland Health needed support to proactively managing all of their assets, so our proprietary Condition Reports and auditing were seen as a great resource,” he adds. But it was also the positive working relationships the AE Smith team had begun to establish that helped the Brisbane team stand out from the crowd. Various technicians were already working at some of Queensland Health’s facilities, demonstrating a responsive, reliable and respectful on the ground service approach that didn’t go unnoticed. “We’d been told that Queensland Health were impressed with the professional attitude and friendliness of our technicians, who are really the face of our business and critical to developing long term partnerships with our customers,” adds Matthew. Conducting work in hospitals requires certain sensitivity for security reasons not to mention upholding specialist safety requirements while conducting maintenance in public healthcare places. AE Smith technicians approached these special needs by undergoing police checks, implementing particular safety measures while completing work in public spaces and also being respectful of the amount of public interface while on the job. “It can be all very well and good to be highly capable at auditing, reporting and servicing, but our team on the ground completing the work really need to understand the unique requirements of the customer and in a healthcare environment, these are pretty specialised,” comments Matthew. A team of full time technicians now works across the Queensland Health contract, who Matthew believes have been the secret to AE Smith’s success. “These guys have been doing a wonderful job at really helping this customer with the day to day service requirements that can be highly critical in hospitals, but also developing a really respectful and reliable service reputation,” Matthew says.